None of us gets through life unscathed. Case in point: if my husband died on our living room couch while I watched paramedics try (and fail) to resuscitate him, I don’t know how I would navigate my immediate sorrow, let alone the months and years stretching before me. How would I avoid becoming unhinged? Joy’s unexpected death leaves Santlofer bereft, nearly unable to function. For many months, he cannot eat, sleep or communicate the full extent of his anguish. But—again, this is why I love memoir—he manages to drag himself from the fog of his sleeping pills and put one foot in front of the other. He learns to seek comfort in his grown daughter, in close friends, in art. He starts to draw and write again, a painstaking and critical process that becomes the remarkable launch pad for The Widower’s Notebook. At first glance, Santlofer’s book seems so slim and unassuming, but let me set the record straight: it is raw, accessible, honest and brave. As he lays bare his rage and heartache, he doesn’t just save himself: he creates a narrative that begs to be read in a single sitting. 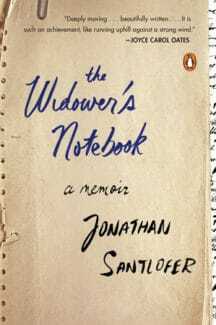 In The Widower’s Notebook, Santlofer ultimately wonders, “So how does one get past such a loss, the echoing silence—no planning, no resolutions, no arguments, no promises, no talking about dreams for the future? How is one supposed to accept that what has happened is true and irrevocable?” He stumbles his way into some meaningful answers, while generously sharing the fruits of his labor with us very fortunate readers.